By Jay L. Zagorsky Published on Jul 27, 2017. A record number of tourists and business travelers visited another country in 2016, and this year is already on pace to exceed that tally. One thing you definitely need when traveling abroad besides a passport is local currency, such as euros in Europe, yen in Japan or rubles in Russia. In the past, travelers would typically withdraw what they need from an ATM in the country they’re visiting or simply use a credit card, letting their bank calculate the cost in their home currency at roughly the market rate. There was usually also a foreign transaction fee. Increasingly, however, retailers, restaurants and ATMs are offering travelers the option to pay or withdraw money in terms immediately converted into their home currency. Companies offering the service call it “dynamic currency conversion.” For example, an American tourist visiting Paris is able to use her credit card to pay for a fancy meal at a French bistro in U.S. dollars, instead of euros. This may seem innocuous – or even convenient – but agreeing to use your home currency in a foreign land can significantly inflate the cost of every purchase. Thinking a bit more like an economist can help you avoid this mistake, and save a lot of money. A century ago, international travel was only for the rich. These days, almost anyone from an industrialized country can see a bit of the world on a budget. While people commonly complain about “high” airfares, the real cost of flying has never been less expensive – it’s half what it was in the early ‘80’s – or safer. And that’s one reason why a record 1.24 billion people visited another country in 2016. Naturally, financial firms have sought to capitalize on all this wandering by inventing ever more ways to separate travelers from their hard-earned money. Tourists rely on credit, debit or ATM cards to pay for hotels, restaurant meals and local trinkets. A complex international computer network checks if a card is valid for the transaction and transfers the money. Traditionally, to help pay for this, banks and credit card companies have charged customers a foreign transaction fee. However, banks are now offering more cards with no foreign transaction fees. At the same time, “free ATMs” are popping up around the world that don’t charge local transaction fees (though your own bank may still do so). So how do banks cover the costs of these transactions if they are increasingly letting consumers use the system for free? One way is offering the option to pay in a user’s home currency. Even some bankers warn against consumers doing this because the exchange rate used is much worse than the one your bank would offer. For example, say you’re a Spaniard visiting New York City and shopping for some clothes at a department store. After scouring the store for the right sweater for your mother, you go to the cashier to pay the US$50 bill (tax included). After you swipe your Spanish credit card (which boasts no foreign transaction fee), the cashier asks if you’d like to pay in euros instead of dollars. If you stick with dollars, your bank would convert the price into euros at about the market rate, €43 at the moment. If you choose to pay in euros, however, the currency conversion includes a fee for the privilege, which may be as much as 10 percentage points. So you might end up paying about €47 instead. The same thing happens with ATMs. I was recently in London’s Heathrow Airport and needed some British pounds. In the old days, an ATM would simply offer a few denomination options, issue me money and my bank at home would eventually calculate the cost in U.S. dollars. Instead, the airport ATM asked me if I wanted to lock in the exchange rate and know exactly how many dollars would be debited from my bank account. I wanted £100 and tried two different ATMs. The currency rate offered in dollars ranged from almost 4 percent to 10 percent more than what my bank charged (or about $134 to $142). I rejected both offers, did the transaction in the local currency and ended up with a total charge of just $129 from my bank. 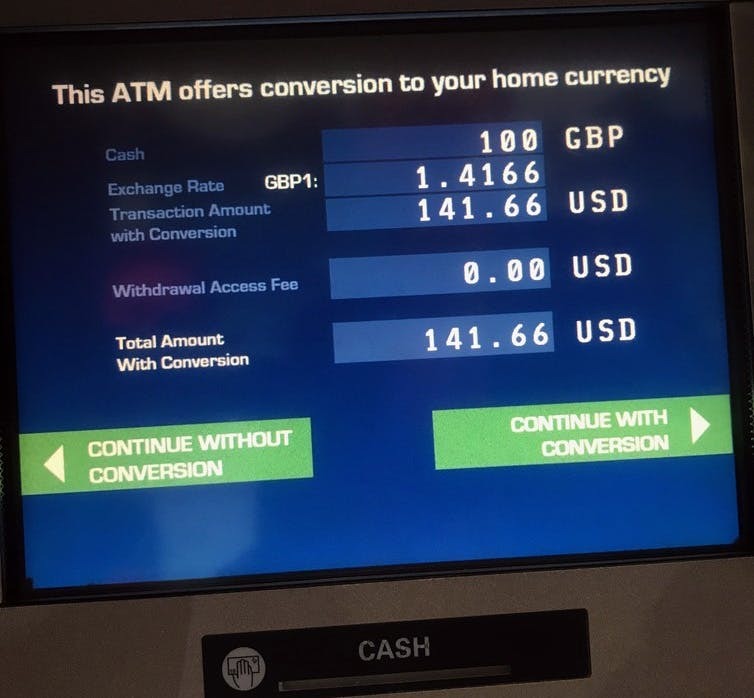 I have observed numerous international travelers as they made this choice, such as an Italian family arguing about it at the next ATM, and most chose the dynamic conversion into their own currencies. So why do travelers pay more by accepting a worse exchange rate when they could simply say no? Economists consider any item as money if it performs three different functions: unit of account, store of value and medium of exchange. Two out of three explain why so many international travelers act the way they do. The first function of money is a unit of account, which is how people post and keep track of prices. This is why banks and credit card companies get people to agree to pay in the currency where they live, instead of using local money. When people travel to a country with a different currency, they often mentally keep track of their spending using their home currency, converting all prices in their heads as they shop and eat. If an ATM or credit card terminal asks if you want to pay for something in the currency you use as your unit of account, your brain says yes. Money also acts as a store of value. Items used as money provide the ability to make purchases now and also in the future. At the end of a trip, travelers not planning on returning to a country tend to spend leftover money in airports buying things they don’t really want. They don’t want to hold onto foreign bills since they are not a store of value. For the same reason, they prefer to be charged in their home currency when getting money from an ATM. Money is also a medium of exchange, which is anything readily acceptable as payment to buy or sell goods and services. This is why people have to convert money when they travel abroad. In New York City, a dollar bill is a medium of exchange for food, drink or a ride on the subway. However, those dollars are not a medium of exchange in, say, China, where waving a wad of greenbacks would mostly get you stares. And that’s why travelers must convert money from one currency to another. When faced with an ATM or credit card machine that asks if you want to convert to your home currency, I recommend you decline, especially if you went to the pain and effort to ensure you have a card or bank with no extra foreign exchange fees. Even if you don’t have one, and your debt card charges a fee, in most cases it still makes sense to use the local currency. An exception to this rule, of course, is if your bank or credit card charges a very high fixed foreign exchange fee and you need only a little bit of money. If this is your case, then saying yes might save you money even if you get a poor exchange rate. The main thing is: Think it through! Resist your natural inclination to say yes just because it makes you feel comfortable. Don’t be fooled when asked if you want to complete a transaction using your home currency. Using the local currency can save you money, making your next trip abroad less costly. Jay L. Zagorsky does not work for, consult, own shares in or receive funding from any company or organization that would benefit from this article, and has disclosed no relevant affiliations beyond the academic appointment above.